We are computer junkies through and through. Our core curriculum is online, as are most of our resources. 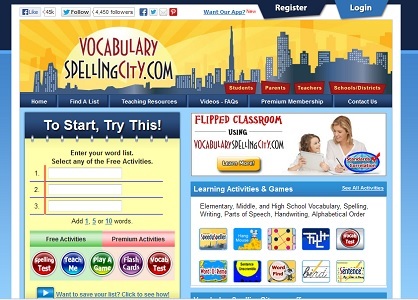 One of our absolute favorites is VocabularySpellingCity! I can take words from our curriculum, or from a book they are reading, or from a holiday/special occasion and create my own word lists on the site. These lists are available to my kids, but also for other members to import into their accounts to use as well. Once the lists are there, the boys can listen to their words, see how they are spelled, play games with them, get tested on them…even use the words in printables and handwriting worksheets. They also have a TON of lists on the site that members have shared, so I can always find word lists for the boys to work on if I haven’t had time to create my own. That’s so convenient! They have a free membership, which can be used very successfully, but they also have a premium membership that I think is well worth the cost. It’s only $29.99 per year for up to five children. With that premium membership comes access to additional games and activities, but it also comes with individual student log-ins. Those log-ins allow me to keep individual records for each boy’s progress (this is SUPER for my record keeping…takes so much of the work away from me!) and to assign specific lists and activities to each boy. This is especially handy for my seven year old who will play HangMouse over and over again if I didn’t instruct him to play something else, lol. My daughter is a reluctant speller, and has struggled with learning to spell her entire academic life. Vocabulary and Spelling City allowed her to review her spelling words without excessive repetition. I know that sounds strange, but let me explain. Vocabulary and Spelling City allows you to enter your own spelling lists, or use pre-generated spelling lists. When I load my daughter’s spelling lists, whether those lists are from science, social studies, or vocabulary lessons, the curriculum allows her to use those words in a variety of learning environments from hig-pig games to find-a-word. Because she can review the words in different formats the review process does not get old or stale. While the program is online, which is wonderful for my daughter, who does not like work-book type reviewing parents also have the opportunity to print worksheets, penmanship pages, and spelling review pages. For students who benefit from worksheet reviews, the ability to have these sheets generated with their own spelling word lists is of great benefit. There are two program options, a free section, as well as a premium membership. The cost of the premium membership is reasonable, especially considering the review capabilities, as well as the instructional section. I believe that having the opportunity to review without the reviews being obviously repetitious means my child is more willing to do the reviews and ultimately this means she does the work. Her spelling is showing great improvement and I would recommend Vocabulary and Spelling City to anyone who has a child struggling with spelling.